Vermont Lanterns Brass Clipper Series Lamps. Available in three size and two finishes. 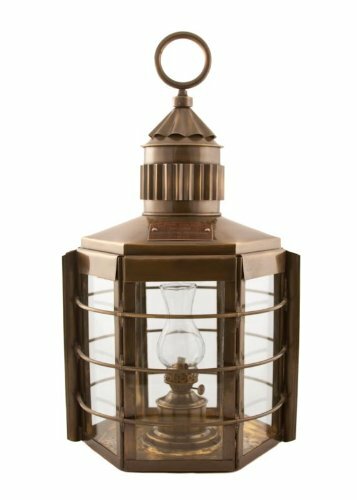 The Clipper Lamp is a beautiful working genuine reproduction nautical lantern of high quality brass construciton. It is fantastic for emergency or ambient lighting, and looks stunning even when not in use. The Clipper lamp is very durabe. Great for your Home, Patio, Boat, Bar,or Office! Great gifts for people who love nautical decor. The Clipper series can be used on a table or hung from its top ring to create a unique wall lamp. This model is not designed to be held by hand while in use, since the top ring gets hot when lit. But is perfectly safe for table or hanging use. Check our other Nautical Series lanterns that have a carry handles. 22" tall and 12" wide. One of our largest lanterns, its presence and size makes an impact. Please measure your space before ordering! Solid Brass Construction, Comes with a wick installed, burns standard Lamp Oil or Kerosene. Vermont Lanterns Brass Clipper Series available in 13", 16" and 22" sizes. Authentic Vermont Lanterns® is a Registered Trademark with the USPTO, and branded onto each piece.